Team Barefoot Endurance Riding, Meet Coal! 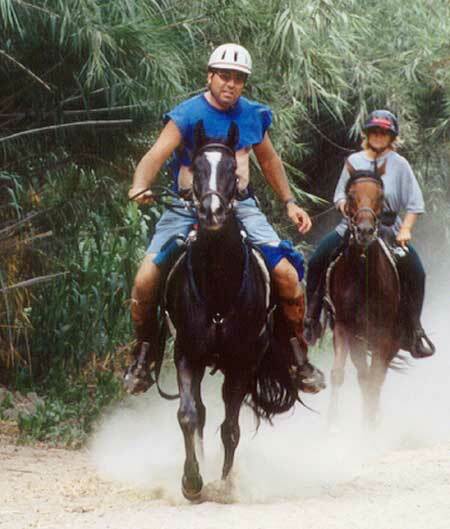 Coal and owner Kirt Lander at an endurance ride in California. Coal is a black, pure bred Arabian gelding born in 1990. He stands 15-2 hands tall and weighs 1100 pounds. After being barefoot only three months, Coal completed his very first endurance ride of 25 miles and finished in 8th place. Boots were used, front feet only on this ride. A month later Coal completed his second 25 mile endurance ride, shown above, totally barefoot. Man Vs. Horse, 2002, 25 miles, 225 pound rider, 8th place. Bar H Boogie, 2003, 25 miles, 225 pound rider, 11th place. Gambler's Special, 2003, 35 miles, 225 pound rider, 6th place. Color Country Endurance Ride, 2003, 25 miles, 225 pound rider, 3rd place. Bear Valley Springs, 2003, 30 miles, 130 pound rider, 8th place.